Women had been wearing bracelet watches around their wrists for centuries before men adopted the same habit. Before purpose made men's wristwatches were created, men had recognised that it was sometimes useful to strap a watch to their wrist, but were afraid of being thought effeminate. To overcome this prejudice devices that allowed a pocket watch to be temporarily attached to a wrist were designed. These looked suitably functional and avoided looking like ladies' bracelets. The principal design was a leather cup on a strap that became known as a "wristlet". Other designs were similar in function, one of which I describe on this page as a watch converter. During the nineteenth century, watches changed from being expensive items that only a few could afford into everyday items that many people needed. This was partly due to improvements in production reducing their cost, and partly due to the increasing importance of accurate time keeping. The railway boom of the 1840 saw transport in Britain revolutionised from slow hose and canal boat to rapid trains. Catching a train meant obeying the time table, which required a watch. Military men soon realised that strategic manoeuvres could be coordinated by time instead of visual or audible signals, thereby increasing the element of surprise. It became possible to arrange for attacks on defended positions to occur simultaneously from all sides without any signal that could alert the enemy. Strapping a watch to ones wrist so that it could regularly be checked quickly and easily whilst on horseback, rather than having to fumble about with a pocket watch, was an obvious thing to do. There is evidence, which I discuss further down this page, that British soldiers stationed in northern India were wearing watches in leather wristlets at the time of the Third Burma War of 1885-7. Pocket watches were adapted for wrist wear by being placed in leather cups with wrist straps like the one shown in the picture. These were called "wristlets" and had the benefit that a man could wear his watch on his wrist when circumstances demanded, and then return it to his pocket when fashion rather than expediency ruled. The earliest patent I have seen for one of these wristlets by G. R. Baldock has the priority date of 7 March 1900 and is entitled "An Improved Watch Wristlet", which of course begs the question, improved compared to what? Clearly there was an existing, pre-1900, design which Mr Baldock thought he could improve on. I have not found an earlier patent, but there was an earlier Registered Design. I have a couple of wristlet watch straps like the one in the picture and they all have inside them the legend "RD 217622". I recognised this as a reference to a Registered Design, so I went digging and found a record in the Board of Trade ledgers as shown in the picture on the right. The entry in the Board of Trade ledger, written in beautiful copper plate handwriting, shows that the registrant is Arthur Garstin of Queen Square, London, a leather goods manufacturer. The date of registration of this design of wristlet watch or wristwatch strap RD 217622 is 2 September 1893. The Garstin company was certainly making these leather wrist watch straps or wristlets before 1893. I have found evidence that they were making them as early as 1888 or even before. I will update here when I have more information. Arthur Garstin established his business as a manufacturer, wholesaler and retailer of leather goods in 1870. A sponsor's mark "AG" was entered at the London Assay Office on 20 August 1888, details recorded as A. Garstin & Co, of 53 and 54 Jewin Street London. In 1897 Garstin & Co. were listed as manufacturers of braces, belts, straps, bags, portmanteaus and watch wristlets, A1 dog muzzles, dog collars and purses at 1, 2, 3, 4 & 9, 10 & 11 Queen Square, and 159A Aldersgate Street, London. Arthur Garstin remained sole partner until the firm was converted into a limited liability company in 1909 as A. Garstin & Co Ltd. I am informed by a correspondent that the Garstin Queen square premises were in Bartholomew Close, East of Barts Hospital and near Aldersgate Street, not the well known Queen Square Bloomsbury that I previously thought was probably his home address. 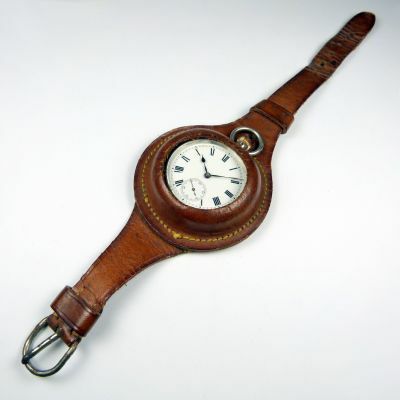 The first wristlets or wrist straps for pocket watches were probably one-off affairs, commissioned by officers who, frustrated with repeatedly having to haul out their pocket watch, realised that it was a good idea and got their local saddle maker or some other leather worker to make a custom strap for them. 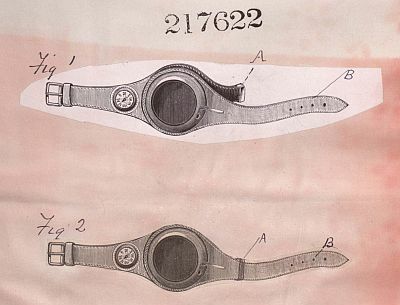 The registration of the RD 217622 wristwatch or wristlet strap design in 1893 shows that by then Arthur Garstin had realised that by 1893 there was sufficient demand for wrist straps for pocket watches to make it worth while going to the trouble and expense of producing an original design that could be registered, and putting it into production. This indicates to me that the practice had started some time before. Where did Garstin get the idea from? Maybe he had a relative or a customer serving in the army who suggested it to him, or asked him to make one and as a result he realised the potential. Adverts by Mappin & Webb during the Great War (see below) state that their "Campaign" watch was first used in great numbers at Omdurman. The battle of Omdurman was fought on 2 September 1898 when a British army commanded by General Sir Herbert Kitchener defeated the army of Abdullah al-Taashi as part of British efforts to re-conquer the Sudan. This was a short time before the Boer war broke out, but no doubt the requirements of mounted cavalry for ready access to the correct time were much the same. The British Army was involved in various overseas campaigns during the second half of the nineteenth century, and it appears that it was during these that British military men began strapping their watches to their wrists. A friend of mine and long time watch collector Richard Edwards has seen a photographs of soldiers wearing watches in leather wristlets taken at Nimal in India during the Hazara Campaign on the Northwest Frontier that can be firmly dated to 9 November 1888 within +/- 48 hours either way, and another photograph showing watches in leather bracelets taken during the Third Burma War of 1885-7. Searching thousands of photographs in the National Army Museum and Royal Artillery Firepower Museum Richard observed no wristlet watches in photographs taken before 1885, but that there were plenty in photographs taken in India/Burma after 1887, so he concluded that wristlet watches came into widespread use by British Empire forces in India or on the Northwest Frontier between 1885 and 1887. In my write up about the design of leather wristlet registered by Arthur Garstin in 1893, I asked Where did Garstin get the idea from? Maybe he had a relative or a customer serving in the army who suggested it to him, or asked him to make one and as a result he realised the potential. There was a Garstin in the 9th Bengal Lancers (Hodson's Horse) from 1877, George Garstin, who took over command of the regiment in December 1894. See britishempire.co.uk [Accessed 30/6/14] for an abbreviated biography of George Lindsay Garstin. Thanks are due to Stephen Luscombe for making this information available. George Garstin was born in India to a chaplain serving with the army, but I wonder if there was any family connection to Arthur Garstin who ran the London leathergoods business? The biography linked to above says that he "missed out on the early part of the Tirah campaign as he was on his way back from England". 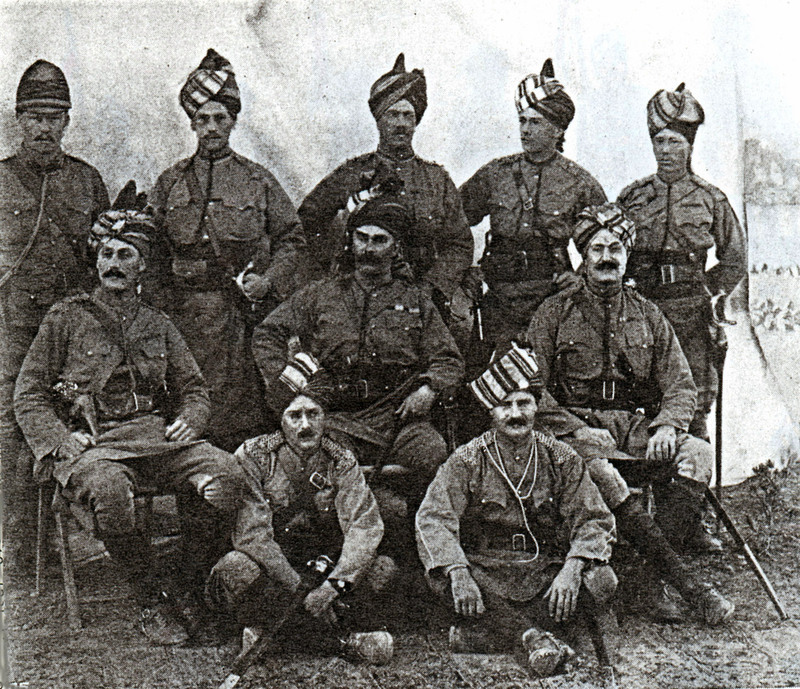 The Tirah campaign was mounted in response to the loss of British control of the Khyber Pass on August 25th 1897 and began in October 1897. This reference shows that Garstin visited England, and as he was 46 in 1897 it may may well not have been his first trip to England. I wonder if on one of his visits to England George Garstin popped in to see a relative, Arthur Garstin the leathergoods manufacturer in London, and discussed design of leather wristlet watch with him? Perhaps the wristlet watch strap Registered Design RD 217622 of 1893 resulted from one of these meetings - George Garstin would have been 42 when this design was registered and had been serving in the 9th Bengal Cavalry for six years by then. The group photo of the 9th Bengal lancers c1897 shown here appeared in the Navy & Army Illustrated. The man seated in the middle is Colonel George Garstin, and the chap on the left in the front row is clearly wearing a wristlet watch. I think the coincidence of the name Garstin and the presence of the wristlet watch in the picture is interesting. In an article in the BHI Horological Journal of August 1998, "The Early Wristwatch in Times of War 1899 - 1920", Dennis Harris remarks that reference to ladies wearing watches in leather bracelets when horse riding or hunting first appeared in the December 1887 issue of the Horological Journal. From this Harris concludes that it is likely that this was the first occurrence of this fashion. However, I would suggest that the soldiers adopted wristlets before the ladies, apart from anything else because men would never have considered adopting female fashions during the Victorian period. 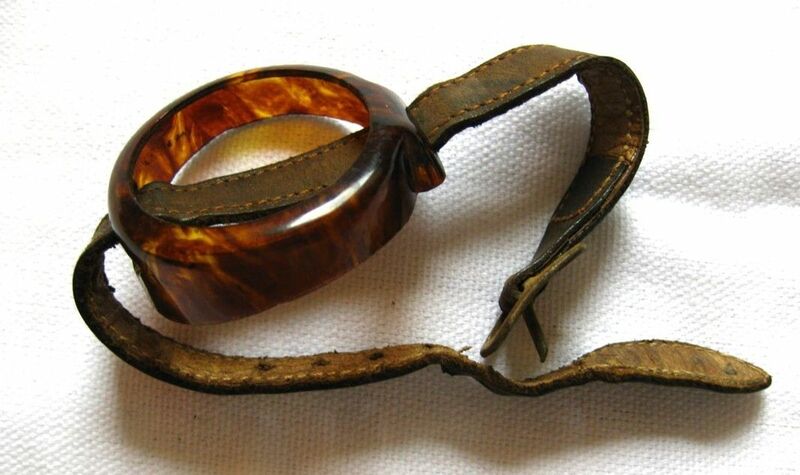 It was also not vitally necessary for a lady to be able to read her watch whilst hunting, shooting or riding, and it seems most likely that the horse riding ladies had seen wristlet watches worn by officers returning from active service and emulated them. The anonymous correspondent writing in the horological journal would almost certainly never have encountered men wearing wristlets on active service overseas who, when they returned home, would mostly wear their watches as pocket watches, but he probably saw the ladies wearing their versions at a hunt ball. The fashion for ladies at home to wear military style items in times of conflict has a long history, and was very noticeable during the Great War, and more recently following the invasion of Iraq in 2003. In 1885 John Kemp Starley invented the first successful modern bicycle, replacing the "penny farthing" with a bicycle that had equal sized front and rear wheels, a steerable front wheel that was self aligning due to caster, and chain drive to the rear wheel. This bicycle was much easier to ride than the "penny farthing" and was taken up by both men and women in great numbers, resulting in a cycling craze in the 1890s. Since women could not cycle easily in long dresses, the bicycle craze resulted in a significant change of fashion as women began wearing "bicycle suits" with bloomers; short skirts over trousers that were tucked into long socks. In 1851 Elizabeth Smith Miller of New York wore what was called the "Turkish dress" to home of Amelia Bloomer, but it was her host who popularised the style of dress in her journal "The Lily". The style was opposed by society until Annie Cohen Kopchovsky wore bloomers during a bicycle trip around the world and the fashion caught on for cycling. 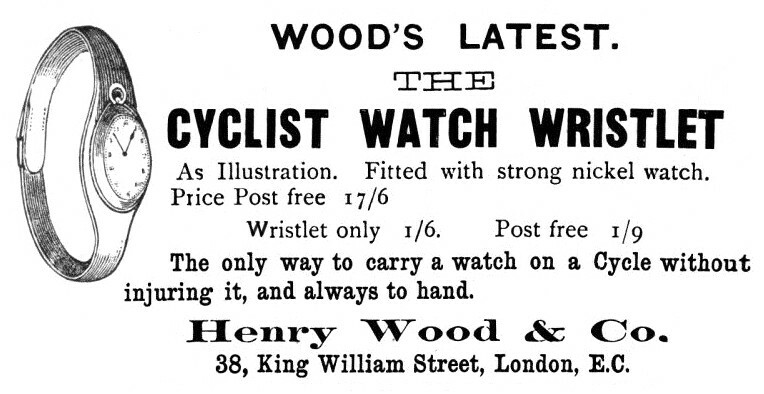 The wristlet watch became popular amongst cyclists as a practical way to carry a watch so that it was easily visible without removing hands from the handlebars, as shown by in the period advert here by Woods from a book on bicycling called The Amateur Cyclist, published in 1893. In the earlier Victorian period, gold bracelet watches were fashionable for women, who were as afraid of being labelled "butch" as men were of being considered "effeminate", but the bicycling craze and the adoption of the more masculine bicycling suit broke the mould, and more women started wearing watches in leather wristlets. Men's attire of course did not undergo anything like this change, which at the time was shocking and sensational, which must be why there exist many more pictures of women in bicycle suits and wearing wristlet watches. Either because they were noteworthy whereas similar pictures of men were not, or because the men returned their watches to their waistcoat pockets when they were not cycling. In his article "The Early Wristwatch in Times of War 1899 - 1920", Dennis Harris records the following statement by Frank Thirkell, a past employee of Mappin & Webb: "I started my career in horology in 1933 with Mappin & Webb and the name 'Campaign' was often discussed, although by that time the watch was discontinued. I remember being told by a senior colleague (A. H. Lorryman) that the first Campaign watch sold by Mappin & Webb was an Omega pendant watch fitted into a leather cup wrist strap and sold to Officers serving in the Boer War. I have never seen a surviving example." This statement may be the source of the often told story that wristlets were first worn during the Boer War. But there is evidence that they were in use in India long before the Boer War. The Second Boer War was fought between the British and descendants of Dutch settlers called Boers (farmers) between 1899 and 1902 in Southern Africa. It was a long war for the time involving large numbers of troops from many British dominions. The Boers operated as self-organising commando units, they were used to life in the saddle and to hunting with a rifle; they knew the terrain, and were highly motivated. Against such a highly mobile adversary, British officers were forced to develop the technique of using precision timing to coordinate troop movements and synchronize attacks against the Boer's positions. Pictured left is an advert from 1901 by Mappin & Webb for their "Campaign" watch. The watch is described as: "Mappin & Webb's 'Campaign' Watch. Solid leather wristlet. Small compact watch is absolutely Dust and Damp Proof. Oxydised Steel Case. Reliable timekeeper under the roughest condition. Complete, as illustrated. £2 5s." The advert says that the watches can be "Delivered at the Front" for an extra one shilling. In 1901 this "front" can only refer to the Boer War war in South Africa. 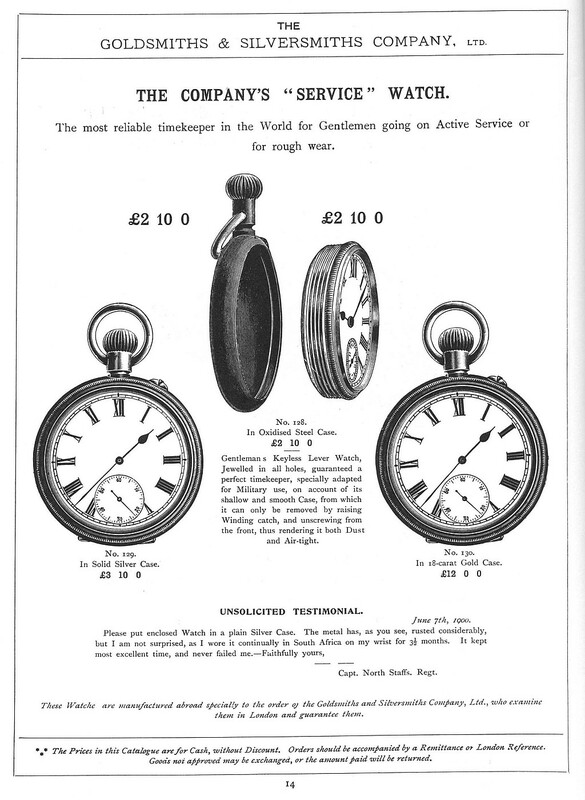 Pictured right is an advertisement which appeared in the 1901 Goldsmiths Company Watch and Clock Catalogue for a military pocket watch, "The Company's "Service" Watch,", described as "The most reliable timekeeper in the World for Gentlemen going on Active Service or for rough wear." The "UNSOLICITED TESTIMONIAL" at the bottom of the advert, dated June 7th 1900, states "Please put enclosed Watch in a plain Silver Case. The metal has, as you can see, rusted considerably, but I am not surprised, as I wore it continually in South Africa on my wrist for 3½ months. It kept most excellent time, and never failed me. Faithfully yours, Capt. North Staffs. Regt.". The captain's watch was cased in the oxidised steel case shown in the middle picture. The oxidised finish was intended to prevent rust, but this was not very successful in damp conditions. At two pounds 10 shillings it was considerably cheaper than a silver case, which increased the price of the same watch to three pounds 10 shillings, or the ultimate 18 carat gold case at 12 pounds. The process of oxidising the steel is described at Black steel watch cases. Although this is clearly a pocket watch, the captain's statement that he wore it on his wrist shows that he had mounted it in a leather cup sewn onto a leather wrist strap, the same as the "wristlet" illustrated above, and he was obviously on active service during the height of the Anglo-Boer war. Was this a wristwatch? A moot point. The watches in the Goldsmith's advert are cased in Swiss patent Borgel cases, where the movement, dial and bezel are fixed to an externally threaded carrier ring, and this whole assembly then screws into the threaded case from the front. The watch in the centre towards the top shows this arrangement. The two watches below are illustrated with hinges at the bottom of the case, but this is an error on the part of the illustrator. Patented by François Borgel in 1891, this screw design was an early attempt at making watch impermeable to water and dust. These watches would have been imported by Goldsmiths from Switzerland complete and already cased. You can read more about Borgel cases on my Borgel page. 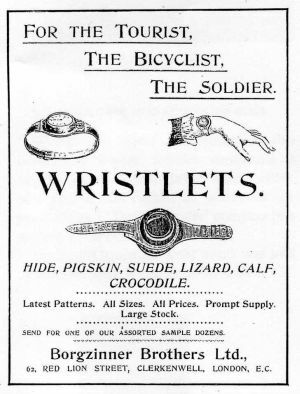 Interestingly, the same 1901 Goldsmiths catalogue contains two pages of advertisements for ladies wristwatches mounted on either rigid or flexible bracelets, and 12 pages of adverts for men's pocket watches, but no adverts at all for men's wristwatches. In 1909 Robert Blacklock of Sunderland, County Durham, applied for two patents for converters that allowed a pocket watch to be strapped to a wrist. The first was granted as British patent GB 1841 in August 1909, the second was granted as GB 25,404 in November 1910. The idea was basically similar to the leather wristlet. 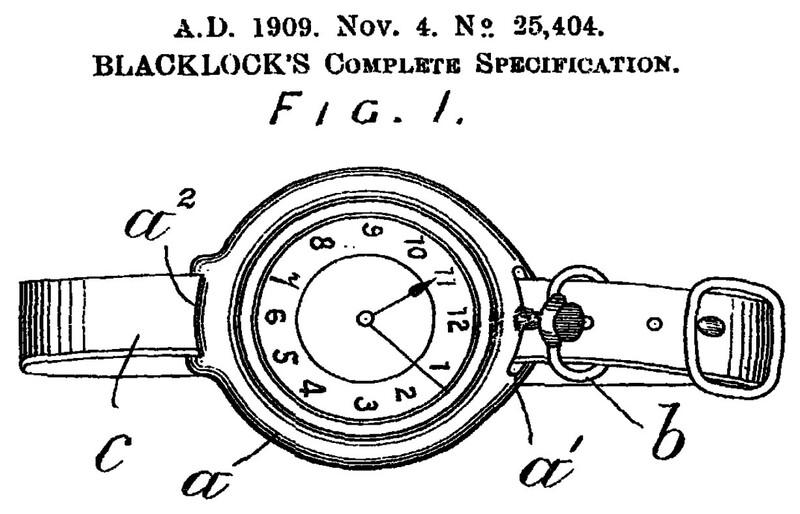 Blacklock's design consisted principally of a celluloid ring that slipped over a watch, having two slots in it that a strap could be passed through. The first image here shows one of Blacklock's converters fitted to a watch, the second shows the empty converter and strap, the third shows a figure from patent GB 25,4041. The date of 4 November 1909 is the priority date, the date when the application for the patent was first lodged. The second patent GB 25,404 incorporated several changes to the simple design of the converter in the photographs. These were metal plates that appear to have been intended to hold the watch in place even when the assembly was not strapped to a wrist. The mottled celluloid converter in the photographs carries the number of the second patent, although it does not have the metal plate and is much closer in design to the 1909 patent. In fact the last digit of the number is unreadable so it looks like 2540_/09. This just meant that I needed to look at up to ten numbers (25,400 to 25,409) in order to discover the correct, and in fact I only got through four before finding it. It would not have been difficult for watch manufacturers, or indeed retail jewellers, to produce watches with attachments for a strap that could hold the watch onto the wrist without the need for the rather bulky wristlet pocket watch adapter. But the pocket watch wristlet continued in production for many years and examples have been seen from as late as WW2. An advert in the 1912 Wm. Potter catalogue shows a huge variety of these leather watch wristlets available from the company, in 7 different sizes and 10 different leathers ranging from cow hide to crocodile, and each leather is available in a range of colours - a huge range. It would seem that the fashion for strapping a watch to ones wrist was seen at the time as a purely utilitarian or functional answer to working needs of a military man, a bicyclist, an aviator etc., but in polite society a gentleman took his watch out of its wristlet holder and returned it to its proper and fashionable place, in his waistcoat pocket. This explains why the majority of early photographs and cartes de visit that show someone wearing a wristlet are of women. 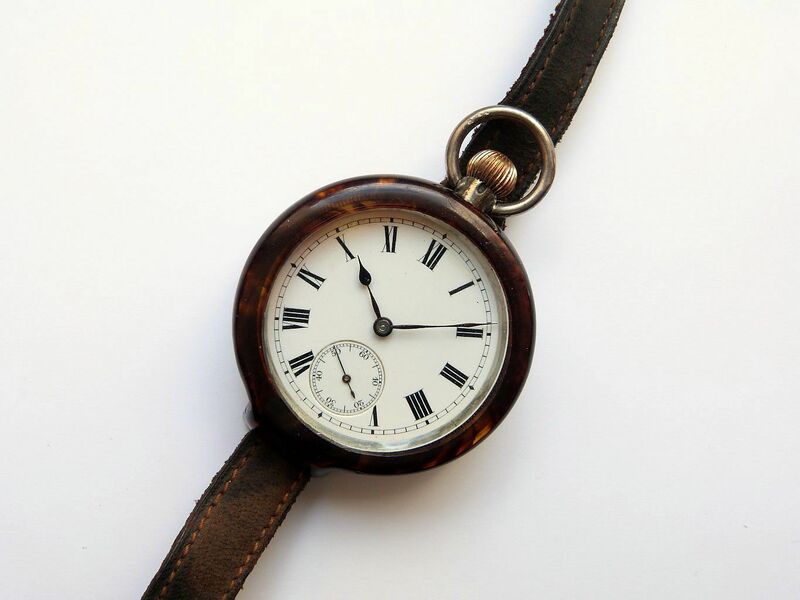 Men were in general too embarrassed to be seen wearing a wristlet watch or wristwatch unless the context justified it, such as being on military manoeuvres, riding a bicycle or flying a balloon. In an ordinary domestic situation a fashionably attired gentleman wore a pocket watch - in his pocket! By the turn of the nineteenth in to the twentieth century the wearing by a man of a wristwatch at certain times was becoming accepted. The creation of the first purpose designed men's wristwatches is discussed on my next page Early wristwatches.